What You Need To Know About Pet Jellyfish! Moon jellyfish (Aurelia aurita) are from the phylum Cnidaria. This phylum contains over 9,000 aquatic species. While estimates vary due to morphological similarities, there are somewhere between ten and twenty species belonging to the genus Aurelia. To the naked eye they are identical. One can only be differentiated from another through DNA testing. All of these species are collectively referred to as moon jellyfish. The name moon jellyfish is purely descriptive in nature. Their name is derived form their most prominent anatomical feature. Moon jellies have large, rounded bells that resemble a full moon. Four horseshoe-shaped gonads (reproductive organs) at the center of their bell add to this semblance, conjuring up images of the caters on the moon. 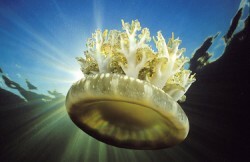 Moon jellyfish are the most common jellyfish on the planet. This is because of their diversity in nature. Moon jellies can be found in almost every ocean in the world. Their natural habitat stretches from the equator as far north as 70° latitude and as far south as 40° in every ocean that falls within those geographic parameters. They are prominent in the shallow coastal waters of estuaries and harbors which explains their abundance in the jellyfish aquarium tank industry an infant branch within the larger saltwater aquarium trade. Because they are common in both temperate and tropical waters, they can tolerate temperature ranges anywhere between 42-88 °F (6-31 °C). Although they can survive in brackish water, a salinity level (specific gravity) of 1.023 will mimic their native marine environment. As pets in a home jellyfish aquarium fish tank, moon jellies are harmless. Their stinging cells don’t produce enough pressure to pierce the human skin. Even if partial penetration is achieved the result will be little more than a mild rash type irritation of the surface of the sting area. In the wild, a moon jellies lifespan is held captive by the dictates of nature. Their life cycle is limited to a single calendar year from start to finish. In a jellyfish aquarium their lifespan can reach in excess of three years if properly cared for. 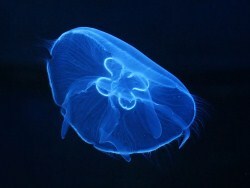 In nature, moon jellies spend most of their time drifting on currents rather that swimming. In captivity, a jellyfish aquarium tank requires a specially designed turbulence system to keep these delicate creatures from becoming a helpless ball of gelatinous goo at the bottom of your tank. The slow methodical way in which moon jellyfish move makes them almost mesmerizing to watch. They look particularly stunning in an aquarium under LED lighting gradually fading from one color to another. 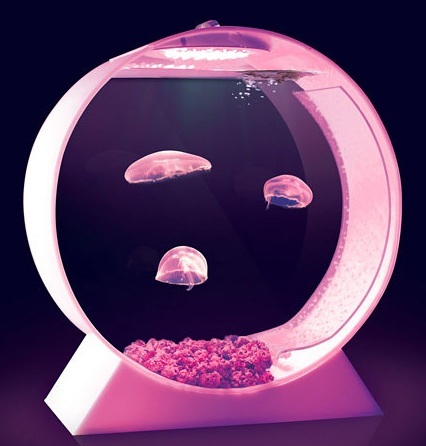 Fortunately, enterprising entrepreneurs at JellyfishArt have taken the necessary steps to design and produce a jellyfish aquarium fish tank specifically engineered to make keeping pet jellyfish no more complicated than your average freshwater aquarium. As a result, moon jellyfish are becoming immensely popular as pets. Just three years ago there was no such thing as a desktop jellyfish aquarium. Moon jellyfish are one of the most easily obtainable jellyfish for home aquarium owners who wish to expand their area of expertise. They are also the easiest jellyfish to keep alive and healthy in captivity. The concept & design team at JellyfishArt captured live moon jellyfish from the temperate coastal waters off the coast of California. They then bred and tank raised Pet Moon Jellyfish for Sale to the general public to insure their year round availability for the demand created by this new, up and coming segment of the home aquarium industry. Tank raised moon jellyfish from temperate coastal regions eliminates the need for an aquarium chiller, a rather expensive investment necessary for colder water jellies like Pacific Sea Nettles. Although moon jellyfish can tolerate a wide range of temperatures, 70-80 °F is most conducive to their adult phase of life. In the wild moon jellyfish can easily grow to up to 12 inches in diameter. Commercially tank raised moon jellies typically range in size from 2-5 inches in diameter. Their growth rate and maximum disc size is proportional to their caloric intake. This means that in a jellyfish aquarium tank they may never grow to their potential maximum disc size. You can, in fact, prevent them from doing so if you wish to keep them in a smaller aquarium. Jellyfish are carnivorous. 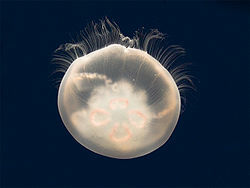 In nature a moon jellyfish's diet consists almost entirely of zooplankton. In a jellyfish tank, pet moon jellies can be fed commercially available frozen or freeze-dried plankton food products or live brine shrimp. Brine shrimp are readily available at any fish specialty store that sells saltwater fish. Many aquarists prefer to raise their own brine shrimp. See Jellyfish Aquariums for more details on feeding pet jellyfish. Blue blubber jellyfish (Catostylus mosaicus) are from the order Rhizostomae. Blue blubbers are native to the Indo-Pacific from Asia all the ways south to the northern shores of Australia. These jellyfish travel in enormous swarms often in excess of a million jellyfish. Their swarms are in fact so large that they are considered a nuisance by Australian fishermen because they can fill up entire nets. They have wreaked havoc with power stations and clogged ship intakes. Blue blubber jellyfish do not have the long trailing tentacles most commonly associated with jellyfish. Instead they have eight oral arms extruding from just beneath their bell forming a circular pattern. Each of these oral arms has thousands of tiny mouths as opposed to a single oral orifice. Although blue jellies have eight oral arms, other related species within this order only have three or four. Blue jellies are among the species of jellyfish that do not have to rely entirely on external sources for their nutritional needs. A large part of their nutritional intake is meant by the symbiotic relationship they have with unicellular algae living inside them. The jellyfish’s body plays host to these algae. In return, part of the algae’s photosynthetic process provides nutrients rich in carbon for their host. Blue jellyfish resort to nocturnal hunting to supply the rest of their nutritional needs. The size of the mouth openings on their oral arms limits what they may consume. They feed primarily on zooplankton derived from the lower levels of their habitat. The blue jelly injects venom into this zooplankton which either kills or paralyzes them thus rendering them immobile for ease of consumption. This venom is not toxic enough to be perceptible to most humans. However, very much like a bee sting, some individuals are more susceptible to this toxin and may experience a skin rash or even an allergic reaction. 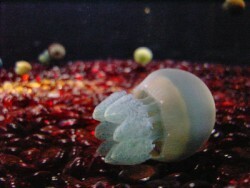 The blue jelly’s unique appearance makes it one of the more exotic jelly specimens currently available to home aquarist. They have become increasingly popular as pets in the Eastern hemisphere because of their almost “other worldly” look and their abundance. Unlike moon jellyfish, blue jellies are translucent rather than transparent. They do not have that eerie, floating ghost-like appearance when light flows through them. They look, however, equally stunning under an LED fader. The combination of their globular shape, they way they swim, their pearlescent reflection, and the colored light passing through their semi-transparent bodies makes them resemble the globules in a lava lamp. They also look great under T5 and actinic lighting. They come in a variety of colors including white, red, blue, purple, and yellow with hues of contrasting accent shades. It should be understood that blue blubber jellyfish have a symbiotic relationship with the algae growing inside them and are reliant on them for a vital portion of their nutritional needs. If you intend on trying to keep them as pets, they will require an aquarium light set up akin to that of a coral reef tank. This will help keep them alive and healthy. They very often come small, but can grow to anywhere from 12 to 18 inches in diameter. Just like many jellyfish, a sudden shrinkage in size is a sure sign that they are not receiving enough to eat. Their lifespan is one year in the wild. We were unable to find any information that indicates life in captivity will negate their natural life cycle and extend their longevity in home aquariums. Blue jellyfish live in tropical to temperate zones. In captivity, a temperature range between 75-78 °F is considered ideal. See Upside Down Jellyfish Pets Upside down jellyfish (Cassiopeia xamachana) are another member of the order Rhizostomae. The species name, xamachana, means Jamaican although their natural habitat is in no way exclusive to Jamaican waters. Populations exist throughout the Gulf of Mexico and Caribbean as well as along the coats of Florida. They are also present half way across the globe in the Pacific Ocean. Upside down jellyfish populations have also established themselves along the coastal shores of the Hawaiian Islands. It is speculated that these creatures where first introduced to Hawaiian shores from jellyfish polyps adhering to the underbellies of war ships returning from the Philippines. This species is prevalent in shallow, warm tropical waters such as mangrove swamps. They are frequently referred to as mangrove jellyfish of the large aggregations found in this swampy saltwater environment. Unlike many species of jellyfish, upside down jellies are exclusively marine in nature. None have been found in brackish or freshwaters. These jellies differentiate themselves from most species of jellyfish in yet another significant manner. Most jellyfish spend the entirety of the adult phase of their lives drifting haplessly on ocean currents. Upside down jellies are only free swimming as juveniles. Once their bell reaches approximately 2cm in diameter it inverts. The jellyfish then sinks to the bottom of its shallow watered domain. They spend the entire adult stage of their lives upside down on the muddy substrate. This points their oral arms (tentacles) in an upward position which allows them to capture and absorb an endless found source from the ever present zooplankton existing in water columns throughout the world’s oceans. Much like blue jellies, upside down jellyfish have a symbiotic relationship with zooxanthellae. This is the same symbiosis that occurs with many jellyfish and coral species. In addition to providing essential nutrients, these golden algae also produce oxygen to help support respiratory metabolic functions the jellyfish needs to survive in oxygen poor environments. This is of particular importance to upside down jellyfish because they spend the vast majority of their life nestled in muddy substrate and must rely on their food to come to them. Because of their specialized eating habits, upside down jellyfish are usually found in nutrient rich waters with high concentrations of decaying matter to support the zooplankton teaming within these swampy, saltwater environments. 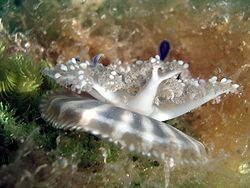 Upside down jellies have flat, saucer shaped bells. Their umbrellas are typically greenish grey or blue in color. They have a central depression or exumbrella in their bell. The exumbrella acts as a suction device to help them stay anchored to the ocean floor. Rather than a single mouth opening, they have 4 elaborately branched oral arms. These arms have a frilly, lace-like appearance similar to many green, leafy vegetables. They are often referred to as cabbage-head jellyfish because of these appendages. It is believed that this species a filter feeder and also relies on some form of absorption of dissolved nutrients directly from the water to supplement its nutritional needs. Upside down jellyfish do not directly inject their prey like most jellyfish do. Their nematocysts (stinging cells) are controlled by the cnidocil. This is the equivalent to a mechanically or chemically triggered grenade launcher. The stinging cells launched from the cnidocil produce a cnidoblast that will stun or paralyze prey in the immediate vicinity. The jellyfish then begin ingesting their prey with their primary mouth openings. Once the prey is reduced to food fragments, these nutrient particles are passed on to secondary mouths for further digestion. The jellyfish’s cnidoblasts also function as a self-defense mechanism. If abruptly disturbed, large groups of these jellies will launch themselves upward from the ocean floor and release their nematocysts. This massive venom release into the water is usually sufficient to ward off potential predators. The toxic compound is generally inconsequential to human beings. It may result in an itchy or tingling sensation of the skin or a rash on individuals more sensitive to the venom. Upside down jellyfish can reach up to 14 inches in diameter in the wild. In captivity a maximum growth potential of 8 inches is more realistic. Depending on their size in captivity, upside down jellyfish can be fed zooplankton, or small invertebrates and fish. In order to allow their symbiotic algae to properly photosynthesize, a lighting system conducive to a marine reef tank is highly recommended. These jellies have a higher temperature tolerance than most scyphozoan medusa. Medusae or adult jellyfish can be found year round. However the optimum temperature for these adult jellies is between 75-78 °F. This simulates the height of the adult season. Upside down jellyfish typically strobilate during summer or early fall. Whereas most scyphozoans strobilate during the winter months. 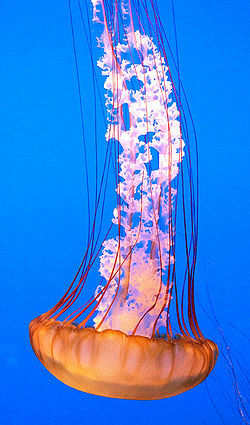 Sea Nettles are one of the most popular exhibits in public aquariums. Their movement looks like sheer poetry in motion. Sea nettles inhabit the Atlantic (Chrysaora fuscescens), Pacific Ocean (Chrysaora quinquecirrha). Depending on the species, they grow anywhere from 6 inches all the way up to three feet in diameter. Typically their trailing tentacles reach over twice that length. Pacific sea nettles are the larger of the two species. The Pacific sea nettle was successfully cultivated in Monterey less than two decades ago. This was the first time they had ever been bred in captivity. Monterey was the first aquarium to exhibit jellyfish to the public. A sea nettle’s sting in very often deadly to proportionately sized prey. Their sting is rated from moderate to severe in regards to human interaction. Their venom is not lethal unless it is the result of an allergic reaction. They will cause moderate discomfort levels in people that are not overly sensitive to jellyfish toxins. Toxicology reports on Japanese sea nettles (Chrysaora melanaster) indicate more serious reactions. Atlantic is generally a pale shade of pink or yellow and may also be striped. Long, flowing tentacles extend from the circumference of the bell generally stretching 2-3 times the bell’s diameter. Sea nettles have a single mouth opening on the underside of their bell. In addition to their mouth, they have a long, lace-like oral arm in the center of their bell that transports their food to their mouth opening.Unlike most jellyfish, sea nettles are very good swimmers and swim continuously. They seem to prefer swimming against the current which is why they are so often seen swimming upside down in most pictures. It should be noted that Pacific sea nettles are the larger of the two species. There are not any readily fabricated aquariums large enough to house them. They will require a custom built set up. You should also be aware that these jellies are indigenous to colder waters, from northern They are accustomed to water temperatures in the mid-fifty degree range. Your jellyfish aquarium will require a water chiller to accommodate their environmental needs. Sea Nettles stinging cells do pack enough punch to penetrate the human skin. Sting victims report anything form a minor tingling sensation to a mild burning of the skin and upper dermal tissue in the stung region of the body. Like most jellyfish, however, sea nettles travel in swarms. Multiple stings from a sea nettle swarm can cause serious although not usually fatal harm to humans.